This is a delicious dessert we came up with on a COLD camping trip. We went camping in Georgia in the early part of November – we were trying to escape the heat that still lingers in Florida that time of year. We were smart enough to take warm clothes, but we had no idea we would have several nights of freezing temperatures and gusty winds off of the water next to our campsite. We were craving some sweet, warm dessert and decided to use the fresh pears we brought with us to satisfy our sweet tooth. Since returning home, we found ourselves preparing this dish often. It is great with fresh pears and it is forgiving enough that both over-ripe and under-ripe pears can be used. 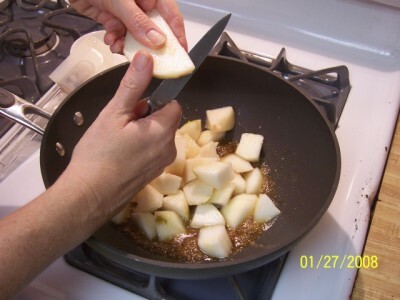 You could also substitute drained, canned pears – just make sure they aren’t packed in heavy syrup. 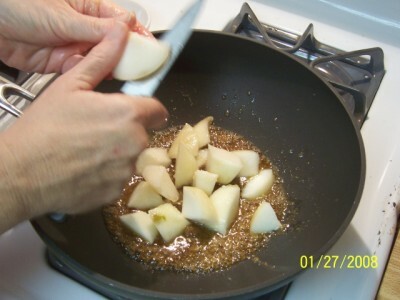 Starting with fresh pears, you can saute them with or without the skins. I normally use one pear per person. These are d’Anjou pears that we have found especially delicious this year. 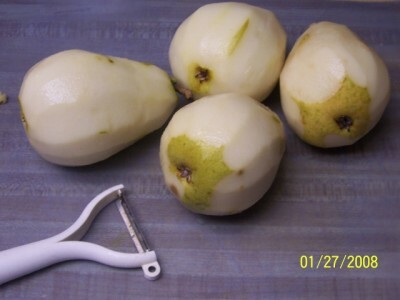 D’Anjou pears are firm and do not turn yellow when they ripen. A gentle squeeze will let you know if they are softening. I always use my Y-shaped peeler to make quick work of most peeling jobs. 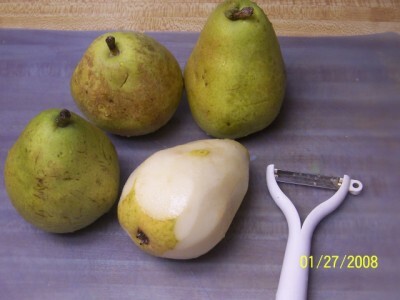 When peeling the pears, you don’t have to be exact and remove every last morsel of skin. The only reason to remove the skin is for texture. 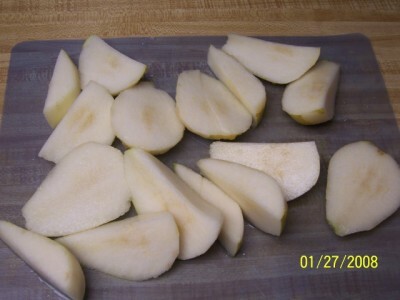 If the pears are quite ripe and you are only going to warm the pear, the skins left on should be fine. If the pears are quite hard and you are going to saute the pears long enough to let them soften, then I would recommend you remove the peel. 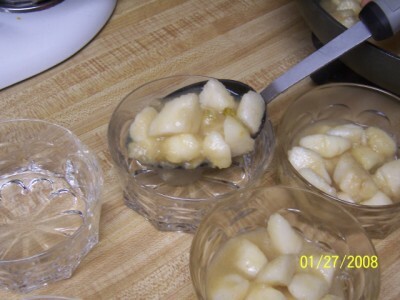 As the pears cook, the skin will slough off the pear and will not be very appealing. All of the pears are peeled and you can see that I am not really careful to remove all of the skin. These pears were nice and juicy and it was hard not to dig in and devour them as is! 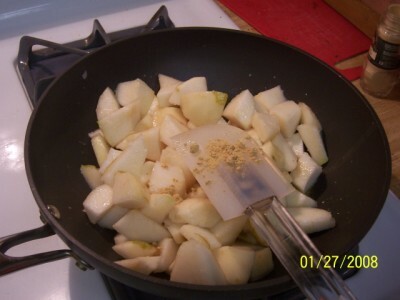 Before I chop the pears, I melt some Earth Balance in my wok-shaped pan. 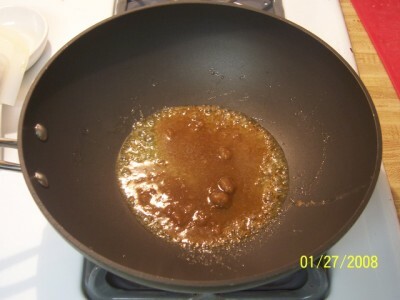 I have prepared this dish in electric skillets, cast-iron, stainless steel saute pans and saucepans. 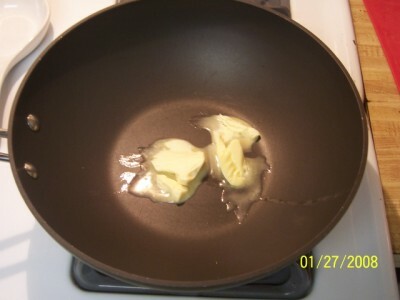 The type of pan is not very important. I usually use about 1 to 2 tablespoons of Earth Balance, depending on how much fat we have consumed the rest of the day and how tight my jeans have been lately. You only need a little to give this dish a rich taste. 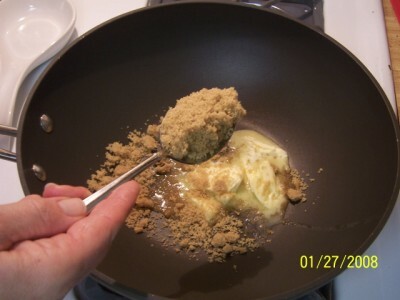 Next, I add about 1 to 2 tablespoons of brown sugar. This measurement does not need to be exact either and is wholly dependent on the sweetness of the pears, our tastebuds and our mood. Let the brown sugar and Earth Balance heat thoroughly and create almost a glaze. While everything was melting, I quickly removed the pear flesh from the core. 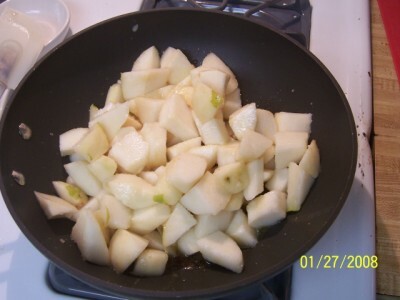 The pears are now ready for chopping and adding to the pan. 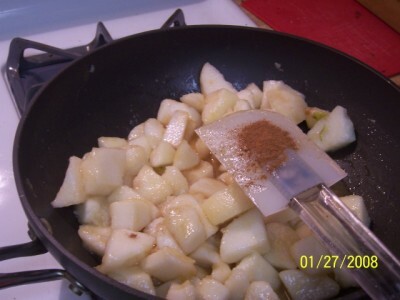 Call me lazy, but I cut up the pear over the pan. This way, I can keep an eye on the butter and sugar to make sure nothing gets too hot. It also is a great space-saver for when you are working in cramped conditions. 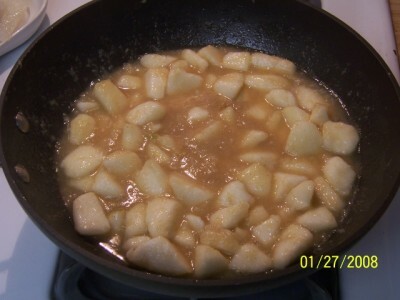 Finally, all of the pears are in the pan and we are ready to start adding a few spices. When we were camping, I did not have anything other than brown sugar and Earth Balance and the dish was still tasty. Once home, we began to add a few other spices. 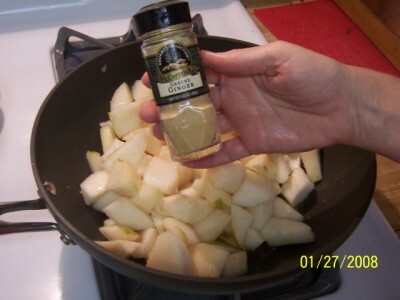 Grab your ground dried ginger for a great pear pie taste! 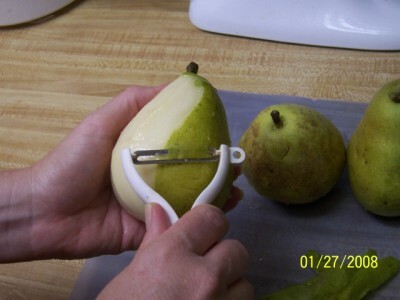 I don’t take the time to measure while preparing the pears. I use about 1/2 teaspoon ground ginger. If you are preparing more pears, use more. 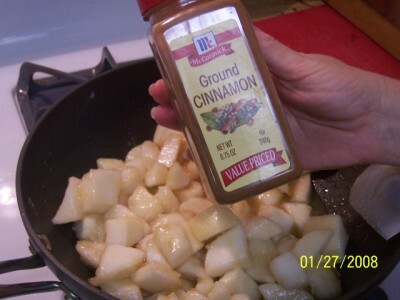 My husband loves cinnamon on just about everything! about 1/2 to 3/4 teaspoon for 4 pears. Once the spices are added, stir to thoroughly combine. It only takes a minute or two after all the ingredients are added to make a nice warm compote like you see here. If you notice that your pears are a little too runny, just add a little water (1/4 cup or less) with a tablespoon of cornstarch blended in. This will thicken the dish almost immediately. 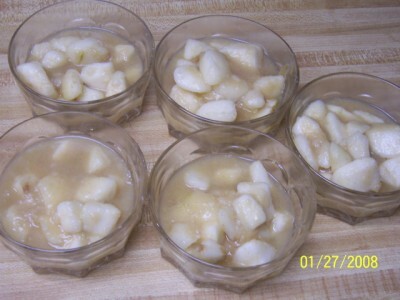 Once the pears are warm and the mixture thick, dish out the pears and enjoy! Nana was at our house that night so we fed 5 people on 4 pears. A little bit of vanilla soy ice cream on top and the dish is pure heaven! For more picture recipes, click here. This looks so good and EASY! I can’t wait to try it. I love your site! yummy! I’ll try it Friday night with the Laughing Ladies group. 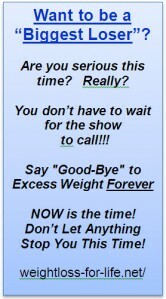 You might want to make extra!